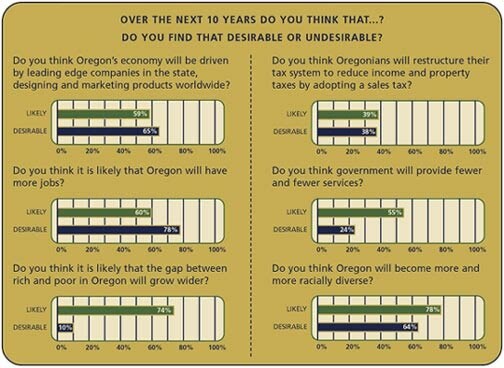 Throughout the survey we asked Oregonians what they think will happen in the state over the next 10 years. We also asked them if they wanted those changes to happen. 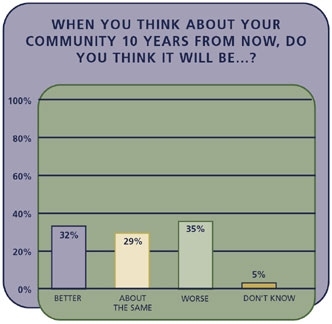 On topics from taxes to the economy, from education to the environment, we asked them to predict the future. Sometimes they envisioned a future they want to see. Sometimes it was a future more grim. "As the population keeps growing, the economy comes back and people continue to move into the state, we are going to have big infrastructure problems in just dealing with day to day life if people don't get off the dime and start dealing with it."